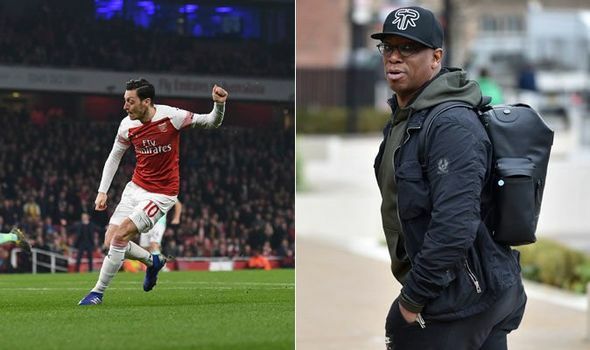 Ian Wright has disclosed an observation he made while Mesut Ozil was celebrating his goal against Bournemouth. The German international scooped the opener in a match that saw Arsenal run riot in a 5-1 victory over Eddie Howe's side at the Emirates Stadium. Also on the score sheet were Henrikh Mkhitaryan, Laurent Koscielny, Pierre-Emerick Aubameyang and Alexandre Lacazette. Ozil's return to the starting lineup brought with it mind-blowing scenes which included his display in front of goal in the fourth minute when he slapped the ball against the ground to lob the visiting goalkeeper for his goal. The midfielder's display has since caused an uproar from fans that still demand to know the reason he is being left out of the squad by the manager on many occasions. Taking an initial look at the 30-year-old's left-footed strike, one might think that it was just the conventional chip over the goalkeeper but that was not the case on Wednesday night. It was a more advanced kind of lob that required him to hit the ball to the ground so it could bounce over Artur Boruc and an Arsenal legend noticed that too. “He kicks down on to the ball. He bounces it on purpose. He did it against Huddersfield and he kicked down on to it against Bournemouth. “Instead of chipping it over a keeper he bounces it over him. You can see him telling everyone what he did [while celebrating]. It's the North London derby against Tottenham Hotspur on Saturday and hopefully, we will see the highest paid player at Arsenal in the starting lineup once again.